Preheat the oven to 180C, gas mark 4. Place the butter, sugar and eggs together in a large mixing bowl. sift in the flour, baking powder, cocoa and cinnamon and beat until thoroughly mixed. Spoon into 2 greased and base-lined round 20cm sandwich tins and levels the surface. Bake for 30 minutes until well risen and a metal skewer emerges clean from the centre of the cakes. Turn out and cool on wire racks. 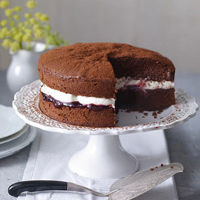 Sandwich the 2 cakes together with the damson jam and whipped cream and dust with cocoa. Have all the ingredients for the cake at warm, room tempreature to make it easy to mix quickly. Utterly delicious with a tawny port, which is light enough not to overpower the subtle combination of flavours and brings a smooth, round and nutty mouthful. Try Sanderman Imperial Tawny Port.